Hilton Head Vacation Restaurants - Cooking With C.C. As I included in last week’s post, we recently spent almost a week vacationing in Hilton Head Island, South Carolina. I was looking forward to some great dinners and especially seafood and the restaurants we visited certainly did not disappoint. Our previous trips were quick trips for a weekend event with Carly in November, right before Thanksgiving. What little free time we had, we were used to walking up to places and just being whisked in and seated. Not the case in the middle of the summer! Many places didn’t take reservations, but some did. We had been to the Skull Creek Boathouse on one of our previous trips and it was one of our favorites from the November trips. We headed over for dinner a little after 6PM on our first day there (Monday) and the parking lot was packed. We parked and walked to the restaurant and were told that the wait was 3 hours. Well, I’m not waiting 3 hours. They did tell us that if we got there by 4:30-5:00 the crowd wasn’t there – noted…. Off we went to find another place for dinner. 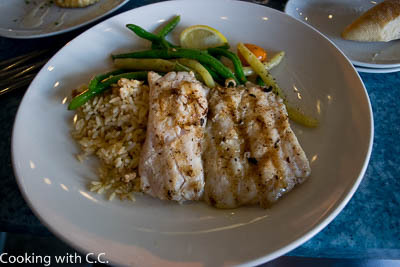 We ended up stopping at a very nice seafood restaurant in the Shelter Cove area called Poseidon. Turns out it is part of the same restaurant group as Skull Creek. For dinner the first night, we had a variety of dishes. Lori and Carly both had appetizers – Crab Cakes, Hushpuppies and Crab dip. I ended up trying Corvina and our guest had an Asian Shrimp and Noodle dish. Everything was excellent and we enjoyed this first dinner. The next day, we went out to Sea Pines and Harbortown. There was a farmers market at Sea Pines, so we picked up some SC peaches and a few other items to snack on at the condo. We visited the lighthouse and several other places at Harbortown. The plan for the afternoon was Outlet Shopping at the Tanger Outlets followed by an early dinner at the Skull Creek Boathouse. We arrived at Skull Creek much earlier this time – around 4:30PM and we were seated immediately. We learned our lesson…. When we ate there before, Carly and Lori had the fish tacos, so that was what they wanted. Two different types of fish tacos were ordered. Their featured special that evening was Tilefish. I had never heard of nor tried Tilefish, so I decided to have that. I was expecting a thinner filet, but instead got a big hunk of fish on the plate. It was extremely tasty and we all enjoyed this meal as well. The next day, we picked up dinner for the girls at Skillets in Coligny Plaza. They ate dinner at the condo while Lori and I went out for the wine tasting (see the previous post) and dinner. We ended up at Charlie’s L’Etoile Verte which was not far from the condo. This was the best meal of the week. Lori wanted the mozzarella and tomato salad as an appetizer – very much like the Caprese Salad we eat so often during the summer. One of the unique things about Charlie’s is that they hand write a menu every day from what they can get fresh that day. Lori decided on the Large Sea Scallops with Yellow Tomato Coulis and I went back to the standby – Local Grouper with Wild Mushroom Sauce. I was looking forward to the grouper, but I wasn’t sure how that was going to go with a mushroom sauce. I do love mushrooms, but the flavor seemed like it might be too heavy for the grouper. I’m glad I ordered it because I was wrong. The “meaty” taste of the sauce complemented the grouper fabulously. The sea scallops were cooked perfectly. Since this was our night out, we ordered a half bottle of wine with our dinner. Ever since our trip to France where we discovered dry French rose’s from Provence, we love these in the summer. Charlie’s had the 2014 Commanderie de la Bargemon, Coteaux d’Aix-en-Provence Rose. This complemented both the scallops and the grouper very well. Suprisingly, it stood up to the mushroom sauce as well. The next day, we were told to try the Hilton Head Brewing Company brewpub which was close to the condo for lunch. The actual brewery is on the other end of the island, near the winery. But they also have the restaurant near the Sea Pines Circle. We showed up for lunch and it was very empty. We decided to try their sample flight of the Hilton Head brews that they were featuring. I really wasn’t a big fan of any of the beers they brought us – most of them were flavored the day we were there. No basic pilsner and one sort of basic IPA were available. As far as the food, the girls had Chicken Quesadilla and Lori had their Brew Pub BLT (With some AWESOME bacon). I, of course, had the grouper sandwich. The food was actually quite good and the fries were some of the best we had on the trip. There was a guest book in the condo and many of them had restaurant suggestions. One of the places mentioned several times was Chow Daddy’s. It was also written up in a couple of the magazines, so we decided to head there for dinner. I was mildly disappointed when I discovered that they had no seafood on the menu. (Now to be fair, they did have open water farmed Tilapia, but that was not really what I was looking for…). Lori told me that since I had eaten fish at EVERY meal, it wouldn’t hurt for dinner. So, I ended up ordering their Fried Chicken Bowl. What was interesting is that they smoked and roasted most of their meats on big green eggs – including the fried chicken. What they did was smoke the chicken breast, then batter and fry it and serve it up. Two of us ordered the Fried Chicken Bowl. (But since I’m not a fan of spicy stuff, I had them leave the Sriracha Sauce off of mine.) Lori ordered the pulled pork bowl. Everything they did was very tasty. We ended up sitting out on the deck and it was a great night for it. Our last night in Hilton Head was Saturday July 4th. We were going to go catch some fireworks and decided to go to the Shelter Cove Area. I researched and found a restaurant that was highly recommended and also took reservations. A number of restaurants that normally take reservations were not making them for the 4th. We headed to ELA’s Blu Water Grille. The restaurant sat right at the inlet to Shelter Cove. This was again a very nice restaurant and happy for me, a top seafood destination. We ordered appetizers of Prosciutto Shrimp and Grits and Lobster Nachos. (Sorry, we were hungry and had them half eaten before someone mentioned I forgot to take pictures…). For the entree’s, I ended up ordering their Grouper served with truffled potato puree with baby vegetables. Lori had been wanting a stuffed flounder all week, so she ordered Flounder Imperial which was basically flounder wrapped around a crab cake. Her’s came with rice and vegetables. The girls were all fished out and pretty much wanted something smaller. They ended up ordering a Chicken Caesar Salad and Maine Lobster Bisque. Unfortunately, about half way through dinner, a huge thunderstorm rolled through. While we had almost all good weather all week, the timing of this storm managed to delay the fireworks. So after dinner we hung out at Shelter Cove until the fireworks finally went off about 10:25. All in all, another successful evening and we had to be up fairly early and hit the road home. All in all, it was a fabulous vacation with lots of wonderful food. The problem is that there are just SO MANY great places to eat at Hilton Head. I’m sure next time, we will return to a few of these places as favorites and seek out others we have yet to try. Oh well, guess we’ll have to go back again…..